Scheck Industries has a long history of dedication to its employees. We have a legacy of mentoring young, talented individuals. We put safety first. And we help our corporate family members build rewarding careers. In this feature, we highlight employees who have not only made a difference at Scheck but who have gone above and beyond in their personal lives, as well. For 30 years, Scheck has supported employees who serve our country and has hired skilled veterans who have brought valuable experience into their work at Scheck. In honor of Veteran’s Day, we are featuring three outstanding Scheck employees: Marty Corr, Shawn Gallagher and Kevin Hera, who are military veterans. He joined an apprenticeship program on his 18th birthday and was doing well in 2003 when he put pipefitting on pause to enlist in the Marines reserve. 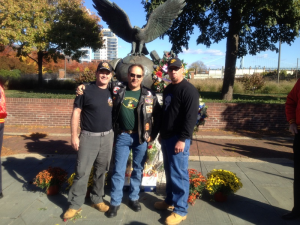 Marty was influenced both by his father, a Vietnam vet, and the events of September 11th, 2001. 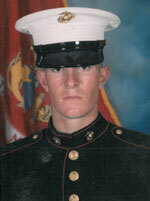 Shortly after boot camp and training, Marty was deployed to Iraq. Today as a Scheck general foreman in the Flint Hills Resources refinery in Rosemount, Minnesota, Marty oversees production turnarounds. He is modestly proud of the strides he and his team have made in managing these complex projects. “I’ve learned a lot from the long-time Scheck ‘steadies’ and they’ve helped me become the pipefitter I am today,” Marty said. Marty observes Veteran’s Day without much fuss, but he appreciates it when the guys at the refinery wish him ‘happy Veteran’s Day’ and thank him for his service. 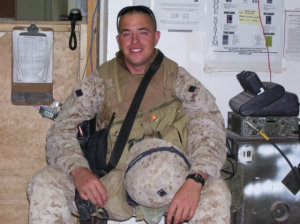 “At home, we have a quiet family dinner with my mom, dad, my fiancé and my sisters.” This year he’ll be home in Evergreen Park, Illinois for Veteran’s Day because he and his fiancé will be married on November 15th. Congratulations, Marty! Shawn Gallagher, a steamfitter with Scheck for two years, works in the Monroe Energy refinery in Trainer, Pennsylvania, but his experience in the craft dates back to 1979. Today, Shawn is well known in the yard as a union-employer liaison, or “bull steward.” The steamfitter trade runs through three generations of the Gallagher family, including Shawn’s father, two brothers and his son, Shawn Jr, a first- year apprentice with Scheck. The Gallaghers are also Marines. Shawn served in Beirut, Lebanon during the 1983 bombing that killed 241 U.S. service personnel. Shawn and his father, James P. Gallagher, a Korean War vet, both earned Purple Hearts. Shawn has the flag that was flown in honor of both father and son at the Wounded Warriors Annex in Texas. “That flag is my treasure,” he said. Shawn encourages vets to look into United Association Veterans in Piping (UAVIP), which offers training and jobs in the pipe trades. On Veteran’s Day, Shawn enjoys a simple observation with his family in Drexel Hill, Pennsylvania. “My wife and kids have always gotten me a card on Veteran’s Day,” he said. “They don’t take it for granted.” Neither does, Scheck, Shawn. Thank you! Kevin began his career at Scheck as a contracted consultant and was hired as an employee in 2008. Today, Kevin runs an IT environment consisting of 30-35 servers supporting PCs, laptops, phones and mobile devices for 130 employees around the country. With his passion for continuous improvement and efficiency, Kevin established a reliable IT infrastructure for Scheck with virtualized servers, improved storage area networks and an internal Dropbox file storage system. He was integral in completing the technology development of Scheck Trac, Scheck’s best- in-class cost accounting and project controls system, a key differentiator in the industry. We thank Marty, Shawn and Kevin along with all our Scheck team vets for their service to our country and their dedication to Scheck. Great employees are Scheck’s most valuable asset. If you know a returning vet who is a skilled construction worker or eager to learn the business, please let them know about the valuable jobs and training programs available to returning service men and women. Links to these resources are below.